This one started with a need to automate when a printer contacted us to help eliminate the hand labor when they were attaching keys to a mailer using temporary labor. Over 20 installations later and millions of keys, coins, poker chips and other 3 deminsional pieces applied to a direct mail peice, we have a placer that works, is user friendly and is built to go the long run in the printing, mailing and packaging industry. 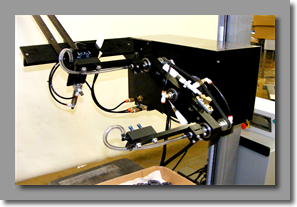 For your next project trust Inline Solutions to handle all of your automation needs.